Melabo is an artist and ceramic teacher in Concord, New Hampshire and one of my favourite sellers on Etsy. 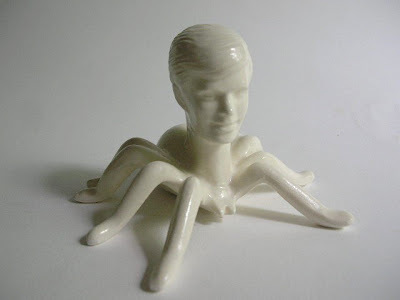 I love these simple white yet very strange ceramic figurines she makes. 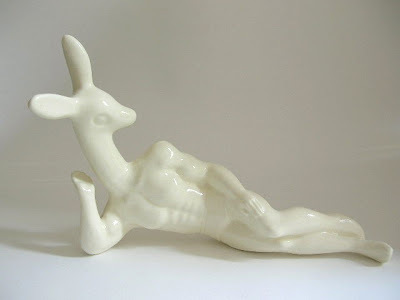 All White Reclining Deerman: “Usually reclining deer man is sporting dashing blue briefs, however due to popular demand, this deerman is all white. Color-free. A pure virginal deerman. Overall the guy is looking fabulous.” I agree. Glossy clear glaze, 7.5 inches long, 5 inches tall and signed, $40 / €28. Cartoon Bear Kitty: “A house cat lost all dignity and developed a goofy teddy bear head. 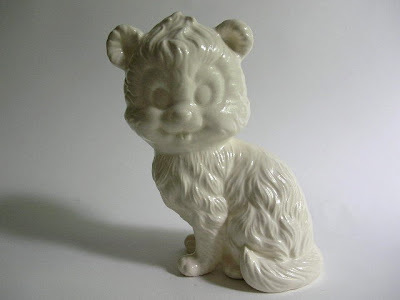 What will the other cats say?” Shiny clear glaze, 6.5 inches tall, 5.5 inches wide, signed, $40 / €28. 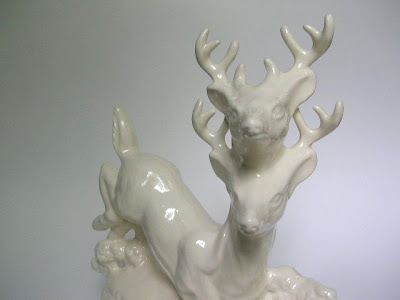 Totem Deer: Nice shiny clear glaze, 9.5 inches tall, 9 inches wide, signature carved into the clay on the bottom of the piece, $50 / €35. 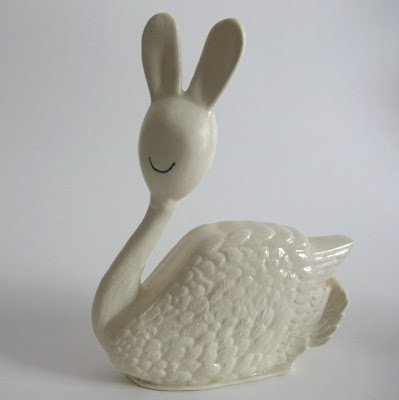 Also beautiful although a little scary (and currently not available): Man Spider and Swan Bunny.